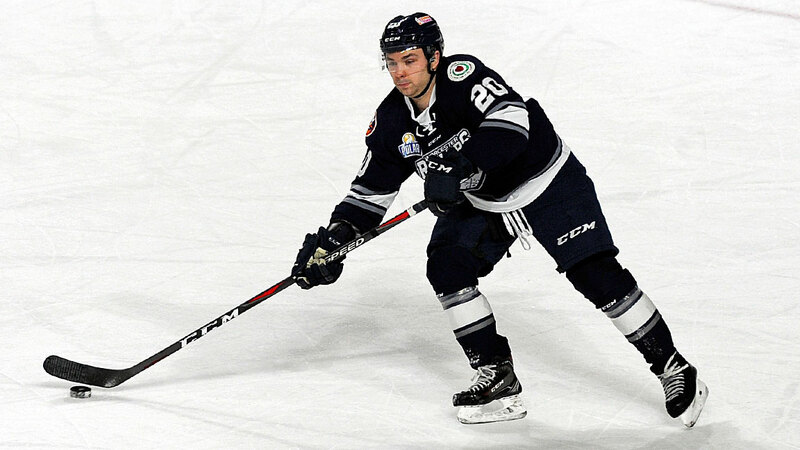 Portland, ME– The Worcester Railers HC(30-29-7-4, 71pts)had their slim playoff hopes terminated in a 4-2 loss to the host Maine Mariners(36-31-2-1,75pts) in front of 3,244 fans at the Cross Arena on Friday evening. With theloss,the Railers are now officially eliminated from playoff contention in the North Division with two games remaining. Worcester will host the Newfoundland Growlers on Saturday at 7pm on Fan Appreciation Night presented by MGM Springfield in the final home game of the season. Josh Holmstrom and Matt Schmalz (1-1-2) scored for Worcester as Blake Wajtala made 18 saves on 22 shots in net in just his third start this season. Taylor Cammarata scored twice to lead the way offensively for Maine while rookie Francois Brassard made 41 saves in net for his first professional win. With the loss, the Railers have now lost a season high eight straight games (0-6-2-0) and finish the season series 4-4-3-3 vs. the Mariners. The game ended with a nasty hit by Brycen Martin on Railers captain Mike Cornell from behind along the end boards well after the final horn had sounded which resulted in all 31 skaters joining a fray that continued for several moments. Maine would score three powerplay goals in the opening period to grab a 3-0 lead through 20 minutes of play. Taylor Cammarata (21st) struck at 9:57 with a wraparound strike followed by Dillon Fox (16th) at 14:12 to give the Mariners a 2-0 lead. Taylor Cammarata (22nd) buried his second of the night with an easy tap in past Blake Wajtala at 15:14 to put Worcester down by three. Yanick Turcotte was ejected at 12:11 of the period after a boarding major after he hit Josh Couturier with a check on the forecheck behind the Maine net. Couturier would start the second period and play a regular shift the rest of the game. Shots were 11-8 in favor of Maine through 20 minutes of play. The Mariners went ahead 4-0 at 9:59 of the second period after Nick Master (3rd) bustled down the middle and deflected a centering feed by Terrence Wallin into the cage. Worcester would get on the board at 16:44 after a Mike Cornell blast from the point was deflected in front by Josh Holmstrom (13th) and through Maine netminder Francois Brassard. Shots were 14-4 in favor of Worcester in the middle frame but trailed 4-1 after 40 minutes of play. Matt Schmalz (9th) got the Railers within two goals at 13:03 of the third period with a snap shot from 30 feet from the left slot assisted by Tyler Barnes and Connor Doherty. That was as close as the Railers would get and well after the final horn sounded, Brycen Martin clobbered Railers captain Mike Cornell from behind with a wicked cross check into the end wall which started a near bench clearing brawl which was quickly separated by the officials. Notes: Three Stars: 3rd star: Francois Brassard (41 saves, Win) 2nd star: Terrence Wallin (0-2-2) 1st star: Taylor Cammarata (2-0-2) …. final shots were 43-221 in favor of Manchester…Francois Brassard (1-3-0) made 38 saves on 41 shots Maine… Blake Wojtala (1-4-0) made 18 saves on 22 shots for Worcester while Mitch Gillam was the backup…. Worcester went 0-for-4 on the power play while Maine went 3-for-6…. Kyle McKenzie (inj), Tommy Panico (inj), Alex Vanier (inj), Evan Buitenhuis (inj), Ross Olsson, Tommy Kelley, Matty Gaudreau, and Ivan Chukarov did not dress for Worcester….. Worcester is now 14-17-1-3 on the road this season and went 1-3-1-2 at the Cross Arena… the Railers have 2 games remaining (1 home, 1 road)… Worcester has 49 fighting majors this season – they had 45 last season….…. The Railers have allowed 22 goals in their last four games….the game featured 60 penalty minutes….Yanick Turcotte picked up 15 penalty minutes and now has 186 penalty minutes this season….Mike Cornell and Josh Holmstrom each fired a game high seven shots on goal. What’s on tap – FAN APPRECIATION NIGHT ON SATURDAY! On Saturday, April 6, the Railers host the Newfoundland Growlers at 7pm on Fan Appreciation Nightpresented by MGM Springfield. Doors will open at 3:30pm for the Boston Bruins Alumni game to benefit Why Me. The first 3,000 fans will receive a Pawtucket Red Sox flex voucher good for any April home game and the first 1,000 fans will receive a $2 Mass State Lottery Scratch Ticket. As with every Saturday night Railers home game, Railers player(s) will sign autographs during the first intermission presented by MidState Auto Group. There will be a ton of in-arena giveaways and prizes throughout the game. The Railers will host a jersey auction at the game through the Handbid App for the orange third jerseys with fans having the opportunity to receive the jersey right off the players back on the ice during a postgame ceremony. In addition, Railers full season members will receive 25% off all purchases on Railers merchandise at the game with your member card. Individual tickets to a Railers game start as low as $15 by calling 508-365-1750 or visit RailersHC.com. The Railers Tavern located behind the DCU Center provides hockey fans with a great pregame and postgame atmosphere all season long. Watch all road games broadcast live at Railers Tavern or watch on ECHLTV.com for a small fee. Listen to all Railers games live on 98.9 Nash ICON with coverage beginning 30 minutes before puck drop with Eric Lindquist and Tom Matthews. Full season memberships, mini plans, and group tickets are on sale now by calling the Railers front office at 508-365-1750 or by visiting www.RailersHC.com. Railers 2.0…. Don’t. Miss. Out!